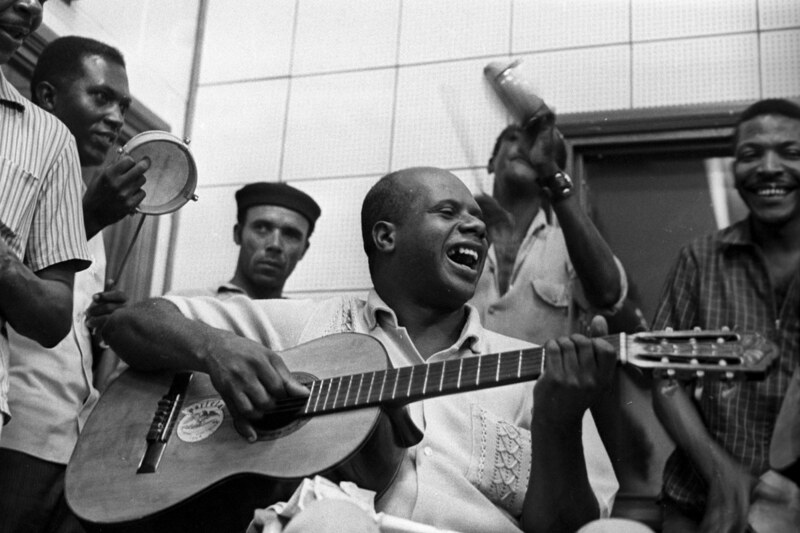 Candeia on the guitar in 1969, with Martinho da Vila behind him. Today, August 17, 2015, would have been Candeia‘s 80th birthday; he died of a heart attack at age 43 on November 16, 1978. Because of his tremendous impact and short life, Candeia has been called a “lightning bolt that passed through Brazilian popular music.” Candeia achieved such greatness in such short time in part because he was born into the Portela samba school in Oswaldo Cruz, Rio de Janeiro, in 1935. His father, Candeia Senior, was involved in the founding of the samba school, and Candeia grew up with birthday parties and holidays celebrated with feijoada, cachaça and pagodes that lasted for days. By age 15 he was a composer for Portela, and by age 17 he had his first Portela carnival championship under his belt, with “As seis datas magnas” (Candeia & Altair Prego). Candeia’s life was short and tough: he spent his last 13 years in a wheelchair, paralyzed by gunshot wounds from a road-rage brawl. But the hardship of being bound to a wheelchair made his music richer and fuelled his social activism, and his untimely death makes his lyrics more poignant to listeners today: His moving verses about life, race, social justice, love, samba, beer and betrayal are some of Brazil’s most beloved. For more on Candeia, go to this earlier, more thorough post: https://lyricalbrazil.com/2014/01/17/coisas-banais-and-preciso-me-encontrar/.